We are on a roll, people! An actual picture of Susan and Danny together. Compliments of Jim. We are having what I think of as one of the quintessential cruising experiences right now. The frustrating kind, that is. We had hoped to jump north to the island of Providencia at the end of February. Providencia is basically due east of Nicaragua but is part of Colombia (you might also remember that all of Panama was once part of Colombia). 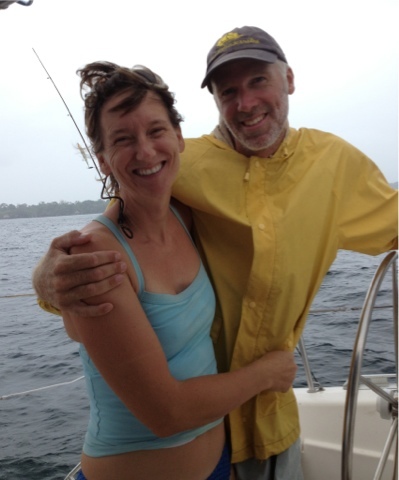 After arriving in Providencia, we were going to hunker down as a front came through and then wait for the trades to resume, which would give us (ideally) a fantastic sail west to the Bay Islands of Honduras. Danny is lucky to have two ways to treat his headaches: meds and breathing pure oxygen. Unfortunately, we didn't have enough oxygen or meds on board to handle a full bout of headaches when they started. So instead of leaving for Providencia at the end of February, we got a SIM card for our phone and started doing the leg work to get a tank of medical grade oxygen and/or meds. Although there are lots of expats here, many who are elderly, getting meds and medical grade oxygen takes a little time. So rather than making a passage to Providencia, we are (and will be) in Bocas a while longer. We are fully aware that this delay is what we have come to call a "gold plated non-problem." I mean, we are in a full-blown vacation destination. But it is nonetheless super frustrating to have this delay when we were otherwise ready to move. That's particularly the case because this next jump is one where it can be tricky to get a good weather window. So basically we now have no real idea when we can leave. Our weather forecaster says that there might be a window the week of March 11th. He's usually pretty good about those long range forecasts, but we still don't know when we'll actually leave. To make it a bit more challenging we have been without wind or sun for a very long time. Our power comes from wind and sun, so we are having a really hard time keeping the batteries charged. So right now we are in Red Frog Marina on Bastiamentos Island, charging batteries and enjoying all of the luxuries of a marina -- garbage, long showers, unlimited fresh water (i.e., we don't have to make water), walking on land without a dinghy ride, and laundry machines. You'd be surprised how thrilling those luxuries are. 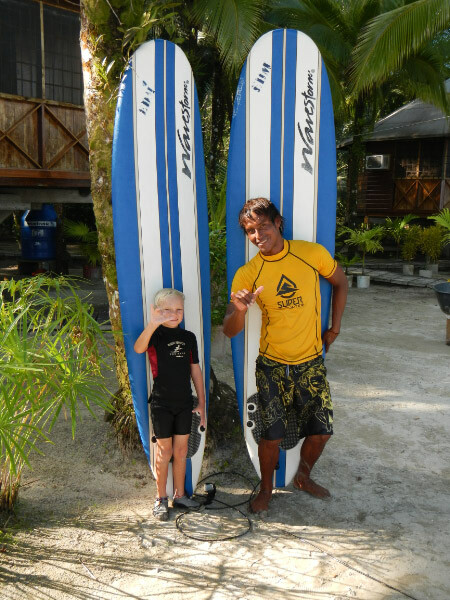 Rye with his instructor, Manuel. Two sad people passing the entrance of the Canal and NOT going in. So while the crew of Blue Kai gets softer and softer living on a boat in the tropics, you should check out the next expedition that our good friends, Chris and Marty, are planning. To Antarctica. Hi everyone. 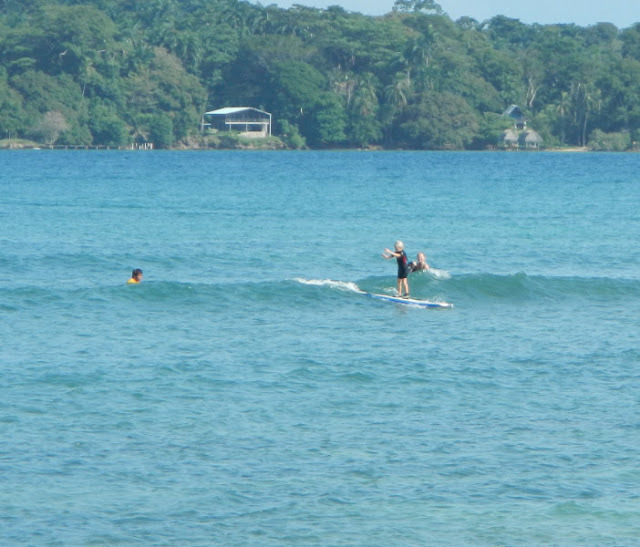 We are still in Panama, currently based in Bocas del Toro (on the west side of the country). We've had a lot of adventuring here in Panama, but surprisingly little access to the internet. Thus the radio silence on our end. Our first landfall in Panama was the San Blas islands. And our time there was certainly one of the highlights of the trip - 33 or so days in the islands, including visits from two sets of close friends. A big part of the magic of the San Blas was how much time we spent with other kid boats, including both new friends and old. S/V Sueno from Quebec, and S/V Flour Girl from the USVI, both of whom we'd met briefly in Grenada and traveled with starting in Aruba (so through all of Colombia). There was also S/V MacPelican from Australia, who we picked up in Cartagena, and S/V Dolphin, who we also knew in Grenada. 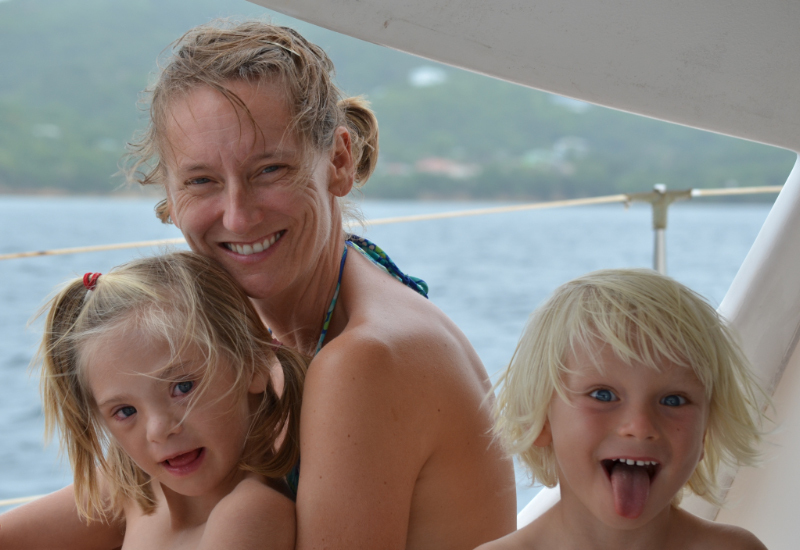 We met S/V Chaotic Harmony, a wonderful family from Australia, who we felt a kinship with over many things, including fast cats (theirs much faster than ours) and the interesting experiences that come with having and cruising with a daughter with a disability. We met S/V Sinan (who we are still near), and S/V Valpar, with Boris and Sylvia and their 435 Nautitech (a slightly smaller version of Blue Kai). And there were a few more kid boats from France who we didn't spend quite as much time with. But it was a kids bonanza, and since we were in the San Blas for Christmas, our timing couldn't have been better. From the San Blas, we headed to Portobello, which is the Panama trading port where the Spanish stored and transferred gold from the earliest conquistadors through 150 years ago (or so). It was the heart of the Spanish Main, where pirate tried (and often succeeded) to nab Spanish gold. There were once 8 forts in Portobello, but now there are only the ruins of about 3 (plus lots of other random ruins sprinkled throughout the town). The town has been sacked by Sir Francis Drake and Henry Morgan among others, so there is a lot of amazing history here. To give you a sense of how much gold the Spanish extracted from South and Central America, it is estimated that one third of all the gold in CURRENT circulation in the world came through Portobello, Panama. Unfortunately the town itself is really rundown now and in many ways a huge dump. (In fact, the town landfill is next to both the tourist office and the historical Customs House where the Spanish stored and counted their gold.) At times Portobello seemed like a diamond in the rough and at times it just seemed rough. But many of the kid boats were still together at that point, which helped us enjoy our time there exploring rivers and ruins. As soon as we arrived in the San Blas, we started to seriously discuss whether we were going to head across the Pacific. It's hard now to remember for how many days we really suffered the decision, but it was many. Ultimately, some time in Portobello, we made the decision not to go through the Cacnal and across the Pacific this trip. And although we are committed to the decision, I think Danny and I are still not 100% settled about it. The short version is that, as adventurers, Danny and I want to cross the Pacific like nothing else. And that's probably an understatement. We've realized over the course of the year how perfect our boat is for a big ocean crossing - we are long and fast and can carry lots of provisions without losing performance. (A quick shout out to our broker, Phil Berman, who recommended this boat for exactly those reasons). We were traveling with three great kid boats who were crossing (Sueno, Flour Girl and MacPelican), and we were right there - right at the canal. It was right there - we could have just gone. So how to describe the decision not to go? It's hard to describe how much time and energy it takes to run the boat and take care of it along with our kids. And our kids are not yet of an age where they can really help out - most of their energy is spent tending to their own needs and it still takes quite a lot of energy to get them to contribute to the larger whole. Ironically, however, in the last week Rye has become Mr. Helpful, so we think he is probably right on the cusp of becoming a really helpful crew member. As for Hannah, we are still working really hard to figure out her mood swings. There are days when it seems like she may have some kind of systemic health issue that could benefit from professional help back home (like a food allergy, or sleep apnea or something). Or maybe it's nothing but her version of growing up, but right now, her mood swings and inclination to not follow directions are taking a pretty big toll on us. In addition to our two very young crew members, we spent more of our cruising kitty in the Eastern Caribbean than we had hoped. That is a very common scenario, so we are not surprised, but it would make a trip across the Pacific right now more stressful. So we left Portobello and spent a wonderful week or two in the Rio Chagres, a jungle river near Colon and the Canal. We were still with some of our friends - Sueno and Flour Girl and Sinan - and had some wonderful adventures, including hiking to find the howler monkeys we heard every morning at daylight. But eventually our "Gypsy Family" (as Nathalie on Sueno called it) had to separate as dates for Sueno and Flour Girl to transit the Canal came near. We had a wonderful but very tearful farewell breakfast on Blue Kai there in the Rio Chagres - 16 of us in total - and it still makes me very sad to think about that parting. We are now in Bocas del Toro, which will be our last stop in Panama. 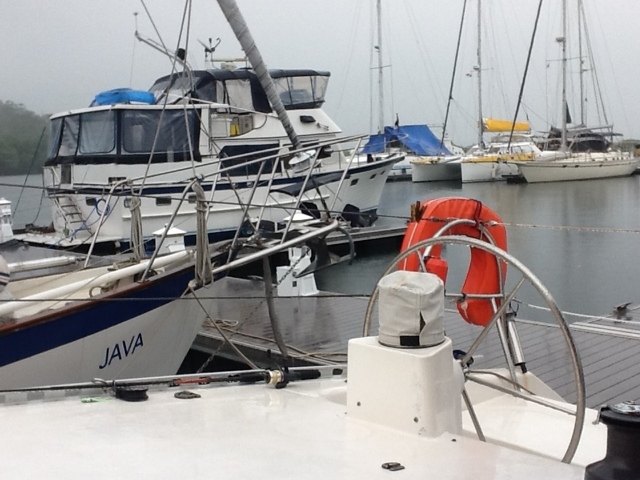 We have enjoyed many aspects of it, although the weather has been quite cloudy and rainy since we arrived. That's more typical of Bocas, as we are just out of the reach of the trades down here and subject to a coastal convergence zone. Our good from, Jim Jarosz (aka "Crazy Jim," "Dr. Jim") is on board with us for a while, which is wonderful for all of us, and we will be heading north as soon as possible. Unfortunately, "as soon as possible" may not mean very soon as this will be a relatively rough crossing to get to Providencia, as the prevailing winds and seas are on the nose or not far off the nose. So we are closly watching the weather every day, usually multiple times during the day to see how it's trending (it's like a deja vu to our time in the eastern Caribbean). FYI, the route north is likely to be: Providencia Island (part of Colombia), Bay Islands of Honduras, Guatemala and the Rio Dulce, Belize, Mexico and then Florida. We'll post as we have the energy, time and internet. For now, so long from the crew of Blue Kai. (Assuming my internet signal doesn't evaporate, I will post some pictures in a post immediately following). season. That was a really, really hard decision. More later.